4 x 4 enthusiasts often favor a particular brand or product. When it comes to electrical, Enerdrive and Redarc are well known brands with their own following of enthusiasts. At Tong Metal Pty Ltd we offer access to the latest technologies from these two well known brands. We offer three distinct electrical systems, each electrical system either built around CORE Enerdrive or CORE Redarc components. It’s your choice! The system is expertly designed to ensure that the dual batteries are charged while the vehicle motor is running, but once the ignition is switched off, the car battery is isolated from the camper electric system to prevent drainage of the vehicle’s battery. 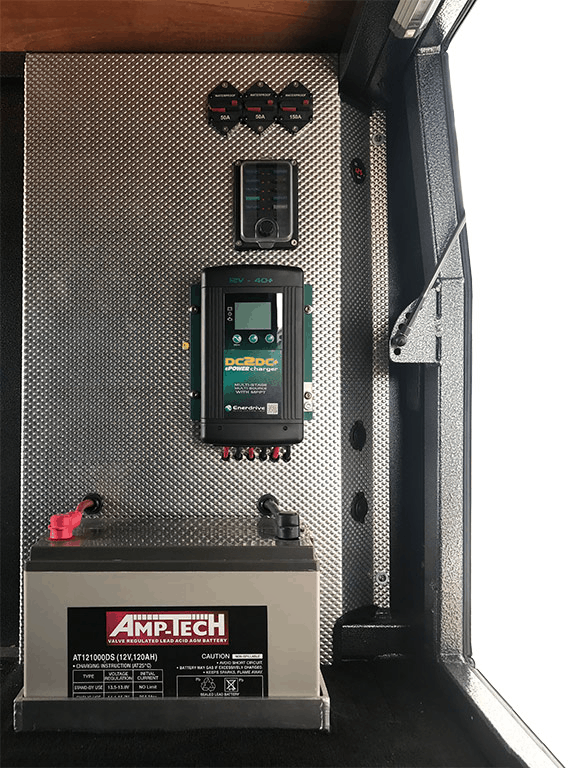 The camper is equipped with an Anderson connector to link the camper’s electrical system to your vehicles battery. Please Note: The Redarc mid and premium systems are more expensive, reflecting different sub-components and capabilities of the Redarc products. The Tong camper, Comfortable Camper System includes everything required for a comprehensive 12volt dual battery system: LED lights and 12 volt power using a 135 Amp Hour AGM Battery. An Anderson Solar Connector is also provided. Anderson Kit – Ute to tray headboard connection. Anderson Connector – Headboard to camper connection. 135 Amp Hour AGM Battery. 1 x Cabin LED, White, Dimmer Enabled Switch (500mm). The Tong camper, Traveler System takes the comprehensive 12-volt dual battery system to the next level: more lights and more power using a 220 Amp Hour AGM Battery. This system also includes a battery monitor plus an Anderson solar connector. 220 Amp Hour AGM Battery. Anderson Battery Charging Connector (Enderdive Only). 1 x Red Safety Light/ Night Light. 3 x Dual USB Sockets. The Tong Camper, Off Grid System is designed for those who want electrical self sufficiency both at 12 volts and 240 volts. The ultimate 12volt dual battery system and 2,000 Watt power inverter provides the complete system for sustained off-grid use. The system also includes a premium 200 Watt solar panel, battery monitor plus an Anderson Solar Connector. The CORE REDARC system takes electrical interconnectivity and management to the ultimate level. The system is built on the REDARC REDVision Total Vehicle Management System that sets an unprecedented level of automation by allowing users to control multiple on-board devices with one easy to use system. See https://www.redarc.com.au/vehicle-management-systems/redvision for full details. 200 Ah Enerdrive Lithium Battery. Anderson Battery Charging Connector (Enerdrive Only). 2 x Reading Lights for the bed. 5 x Dual USB Sockets. 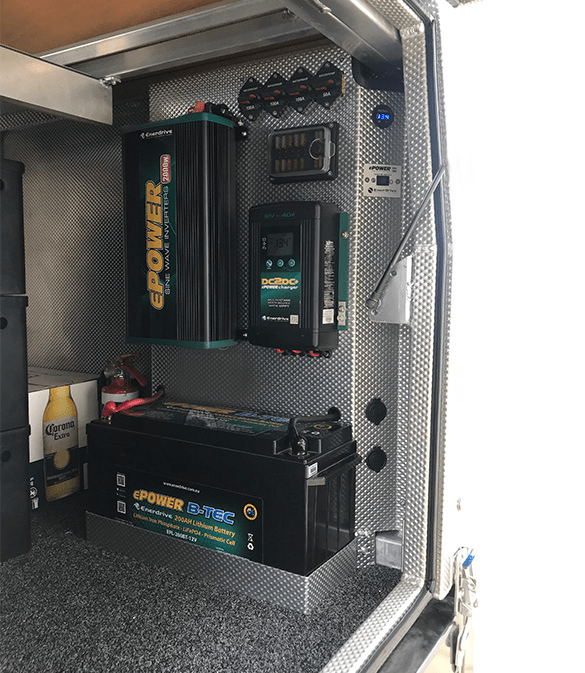 Enerdrive ePOWER Smart Charger 40amp / 12v (EN31240) If your Tong camper is to be stored for long periods and maintaining solar power is not an option, consider an AC2DC battery charger and management system. Without charging, your battery will, over time, loose its charge. Allowing a battery to fully discharge may lead to damage of the battery. 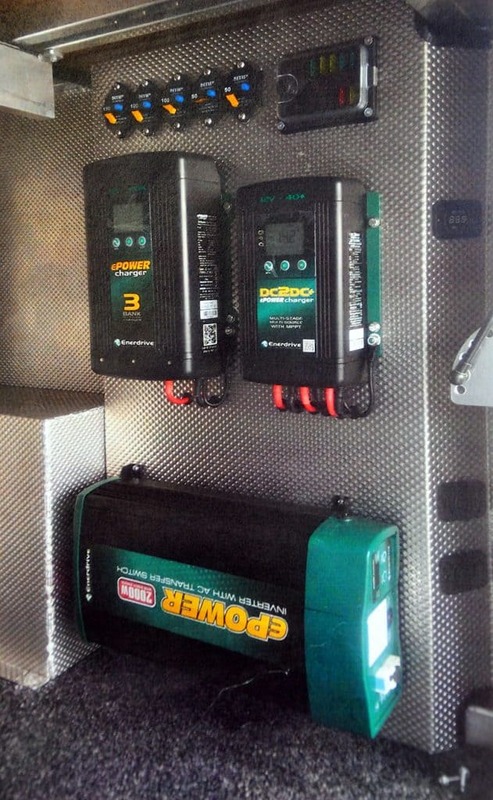 The ePOWER smart charger can be integrated into your electrical system build when ordering your camper. When it’s time to store your camper, simply plug the AC2DC charger into mains power via the supplied cable and let the charger maintain your battery system. When you next travel you will be on your way with a fully charged battery. 200W Fixed Solar Panel (SP-EN200W) You have installed either the Comfortable Camper or the Traveler electrical system into your Tong camper and would like to add a matched fixed solar panel. The Enerdrive standalone, fixed solar panel is the solution. The panel can be installed onto the roof of your camper and wired into you DC2DC charger. Rear Sensor Light On dark nights, some people are concerned about negotiating the camper steps. A secondary concern at night may be animals or other people moving around the campsite. To address both of these issues, you have the option of adding a night sensor light to the back of your camper. The light is installed to the left of the stairs and illuminates the area immediately behind the camper including the steps.